Durable 42″ x 72″ tempered glass backboard with an aluminum perimeter frame for increased rigidity and a professional finish. Printed white border and target. Board is completely supported by a welded steel back frame. Center reinforcements provide a true rebound and eliminates dead spots. Black, molded vinyl backboard padding is pre-installed. Goal is designed with challenges of outdoor elements in mind and offers durability and performance. 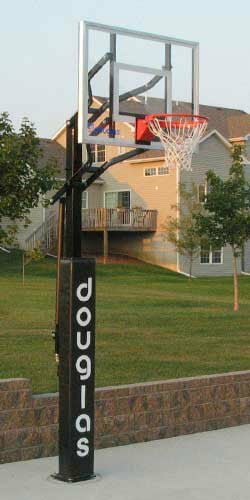 Recreational breakaway goal will protect your backboard from the stress of heavy, unsupervised play and repetitive dunks. Features a 5/8” thick, 18” Steel Rim. Goal has an extended wing brace and a single spring flex breakaway mechanism enclosed within a steel cover. 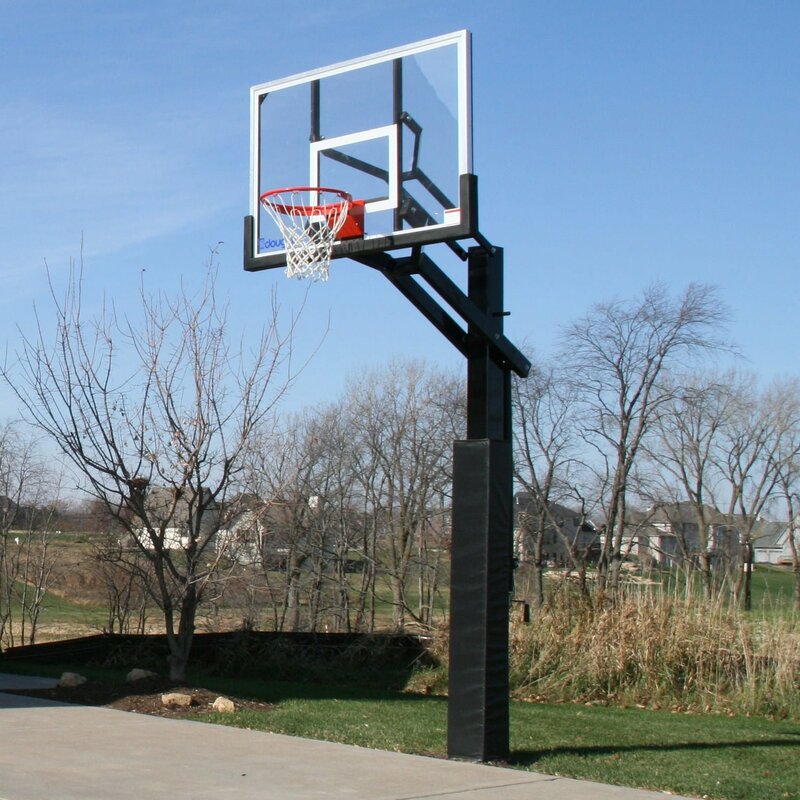 All goals are constructed of durable steel with a CSPC compliant powder-coat finish. Includes nylon net. 1 Year Limited Warranty. Strong reinforced 4′ extension arms. Top extension arm is 1” x 2” steel. The lower extension arm is 2” x 4” for extra strenght and support. Finished with black acrylic powder coat to prevent chipping and provide the ultimate corrosion protection against the elements. Constructed from 6” square structural steel with a 3/16” wall thickness, this system is built to handle rugged play in the toughest conditions. Pole is finished in an attractive black acrylic powder coat to prevent chipping and provide the ultimate corrosion protection against the elements. Pole is a one-piece construction with welded base gussets for increased stability. Pole Includes wraparound style protective padding. The pressure reducing E-Z crank makes it easy to raise and lower the rim height. Crank smoothly adjusts the system from 6’ to 10’.Stainless steel handle is removable for unwanted tampering. Strong anchor system allows for easy and accurate leveling during installation. 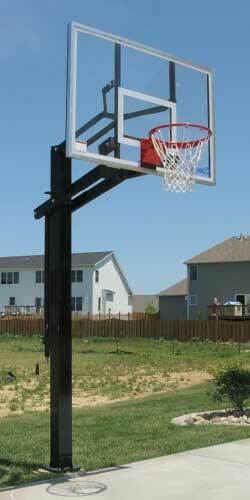 J-bolt anchor system permits you to dismount your basketball system and move to a new location. All you will have to do is install a new anchor system. With the Douglas® Lifetime Limited Warranty you can rest assured that your investment is protected. 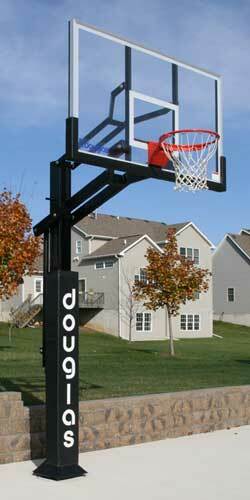 Please contact me with more information about: "Pro™-646 Adjustable Basketball System".